Do you know? New research shows about 70% of mobile users block ads, or they want to do the same. You are a publisher, who makes a living from ads, aren’t you? When you see the huge number of your site visitors with ad blockers, you become disappointed. Being a site owner myself, I can feel the pain. In case you didn’t care about ad blockers till date as your gross earning is massive, I want to tell you something. You can make at least 20% of what you are earning right now if you get a Swiss army knife to fight against ad blockers. In this article, I will give you a clear idea of the loss happens to you as a publisher and what you can do about it. Let me tell you the case of a well-known ad blocking solution ie… Ad-Blocker Plus. According to their official website, the app is active on 100 million devices. Yeah, you read it right. A hundred million !! Obviously, you won’t be able to earn even a dime by delivering content to those who activated ad-blocker on their gadgets or desktop. To be honest, we want to make money! Even with the monetary aspiration, we provide our audience with high-quality content. Imagine all your visitors have AdBlocker. What do you get in return? NOTHING! You get nothing by making the availability of high-quality content easier. Is that what we want? No, not at all! We invest our time, money and expertise to provide value and be sincere in our profession (digital marketing). And, see what our audience gives us back?Imagine your income is $200 per month. I am not exaggerating the number of AdBlocker users. The regular rate of them is 20%. Means without the AdBlockers, you could have kept on making $240. The scene becomes even worse if you have AdBlocker users more than 20% of the total count. Like the salt on the wound, ad-blocking browsers have become popular as well. People opt out for anything to avoid of ads. The ad-blocking app developers don’t even think about website owners who make a living out of ads. They mercilessly regulate the bridle. If the same ad-blocking scenario continues, publishers all around the world are going to face a massive loss of $27 billion by the end of 2020. Let us now think from the other side. 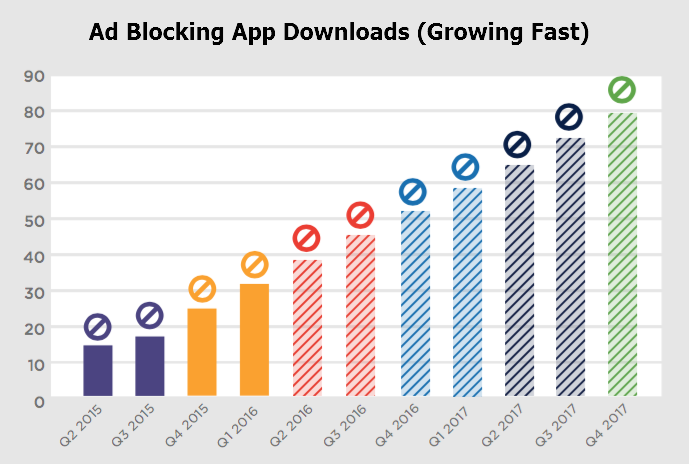 What compelled users to install Ad-Blocker on their devices? Imagine you opened a site and they keep on giving you pop-ups over and over again on each of your clicks. Will you stay there? Of course, not! What if the content is exclusive that you can’t find anywhere? You search for a method to filter out the filthy ads and present the required content all the way to you. That’s what happened with the internet users. They fed up with pop-ups. I must say, we made our own hell. And the end-result affected webmasters using harmless ad networks. What can you do about it? Is there anything to help you with the drastic decrease in your revenue due to ad-blockers? I know you are a fan of AdSense. There’s not even a single signal that Google is bothered by the severe effect of AdBlockers on publishers. Means you have to face the loss. ClickAdu, one of the prominent ad networks introduced an anti-adblocking system just a few days ago. Yeah, they do display pop-under ads. But in a much more convenient way! Visitors will never get bothered by ClickAdu ads. So, what exactly anti-Adblock system does? Let’s say you have signed up for ClickAdu publisher account and implemented the ad code on your website. ClickAdu introduces a specific zone code into their advertisements. Whenever the system detects AdBlocker, the zoning code gets activated and, bypasses the blocker. As a result, the ads on your site are shown to all of your visitors despite they use AdBlocker or not. What did you decide? Are you going to sacrifice the loss? Bear in mind, even now at least 20% of your audience use AdBlocker. In the upcoming years, it will go all the way up to 40 or 50. And, your income will suffer no matter how high you earn right now. You have to take action against AdBlockers that grew as a threat to our profession. Go ahead and leverage the power of Anti-AdBlock now. Act now!! We have to save our profession. Bring this news to every digital marketer you know. Show them they can earn much more than normal. Don’t forget to scribble down your thoughts below.